This work is an exposition of the philosophic conceptions basic to Mahayana Buddhism as found in the Maha prajnaparamita –sastra, a commentary on the Prahnaparamita-sutras and traditionally attributed to Nagarjuna. The Sastra, the earliest and most extensive work in this field, is lost in its Sanskrit original and preserved only in a Chinese translation. Meanings of Sanskrit and Chinese terms are expounded, concepts are made clear, and supplementary materials are supplied in the notes. The study is prefixed with a short historical account of the broad lines of Buddhist philosophy in its early stage. K.V. Ramanan, a teacher of Philosophy, studied the traditional and contemporary philosophies of the Far East in China, Japan, and the United States. In Japan he lectures on Madhyamika at Otani University of Kyoto. The present work has been approved for the degree of Doctor of Letters of the Visvabharati University. Dr. Venkata Ramanan has produced a well-documented account of a difficult but important system of thought. His scholarly approach to his materials, his intellectual discrimination, and his command of Chinese sources (by no means confined to the Ta-chih-tu-lun) will rely earn him wide respect in India and abroad. This enterprising scholar is also well versed in modern Japanese Buddhist studies, and has lectured at Ohtani University and elsewhere in Japan. The present work as indicated in the title is devoted primarily to a study of the Mahã-Prajnaparamita- sastra (abreviated in the present work as the Sastra) which is a commentary on the Prajmaparamita-Sastraof 25,000 gathas, the Pan—canvimasatisahasrikaPrajnaparamita. The Sastra is the most comprehensive work of those traditionally attributed to Nãgrjuna, the well known teacher of the Madhyamika philosophy or the philosophy of the Middle Way. This work is lost in its original and is preserved only in its Chinese translation. Professor ftienne Lamotte has rendered into French the first eighteen of the one hundred chapters (chüan) of this text (Le Traitéde Ia Grande Vertu de Sagesse, vols. I & II, publ. 1944 and 1949, Bureaux du Muséon, Louvain). It is a magnificent work that Professor Lamotte has done, which he has furnished with copious literary and historical notes. This work of Professor Lamotte has been of great help to me. 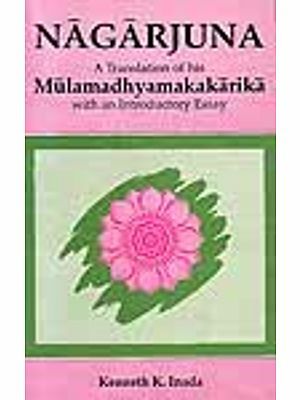 My present work, however, is a philosophical study intended to gives far as possible an objective and complete picture of the Mãdhyamika philospphy as it can be gathered from the whole of this text. Professor Lamotte has advanced arguments to doubt Nägarjuna’s authorship of the Sastra. These arguments have not persuaded me and I believe that cogent arguments can be made in favor of the traditional view. I prefer, however, to postpone such arguments to a later date as they could not aid but would detract from the aim of the present work, which is to set forth the basic philosophical conceptions found in the Sãstra. I hope that it will appear to the reader as it has appeared to me that the basic conceptions of the Sastra constitute a natural continua—on and development of those found in the well known works of Nagarjuna like the Mãdhyamika-kãrikã (abbreviated in the present work as. Kãrika) and the Vigrahavyavartani. If so, my retaining of the traditional attribution can be justified even if one cannot settle the tangle question of its authorship. As Professor Demiéville has observed, this text seems to have sun] into oblivion in India, supplanted by the texts of the quickly rising school of’ Yogäcãra-vijnanavada.’ Perhaps the height of metaphysics to which the Sãstra rises was felt to be too great for lesser minds. Anyway the constructive metaphysics which the Yogäcãra-vijänavada offered on absolutist lines based on the teachings of the Buddha seems to have grown in popularity. Hardly a reference to the Sastra can be found in the Buddhist texts now available in their original Sanskrit versions. In China during the two hundred years between Kumãrajiva and Hsüan-tsan the Sastra was much studied and was extensively in use. But after the time of Hsuan-tsang, with the introduction of Vijñãnavãda it was little regarded as a source book of Buddhist philosophy of the Mahayän tradition. Even where it was in use it was mixed with the constructive metaphysical system of Yogäcara-vijñänaväda. As a scholar, Kumãrajiva’s principal work seems to have been the translation of Buddhist texts; he seems to have written scarcely any independent treatise of his own. We are told that he did write a text called Shih-hsiang-lun (The Treatise on the Real Nature of Things) at the request of the Emperor Yao-hsing, but it is not extant. His oral explanations of the Vimaiakirtinirdes’a (T. 1775), however, have come sown to us through Seng-chao. It is supposed that his influence was due rot to his writings but to his oral explanations and winning personality. Kumärajiva translated several recensions of the Prajnãparamitã-sütras, like the Pañcavimsati-sãhasrikã, the Asta—sãhasrikã and the Vajracchedikã. He translated also such important Mahayana Sütras as the Vimalakirtinirdesa and the Surañgama-samadhi, which breathe the spirit of the Madvamika philosophy. He also translated the Saddharmapundarika. All of these works have been cited in the Sãstra as authoritative. Kumãrajiva translated also texts other than those connected with the Prajnaparmita or the Madhyamika; Satyasiddhis’sastra of Harivarman was one such. But this he did very probably to provide a stepping stone to the mature philosophy of the Middle Way, through its criticism of Sarvãstiväda. Kumarajiva’s appreciation lay in the philosophy of the Middle Way. He was through and through a man of the prajanpãramitã and a follower Nägärjuna. Kumarajiva translated also some texts on the method of dhyãna meditation) and Tao-sheng, one of his foremost disciples, has been counted as a precursor of the Ch’an (or Zen) school. The roots of this school lay in the philosophy of prajñapãramitã and that, principally rough the Mädhyamika criticism of which Nagarjuna was the unsurpassed master. Kumãrajiva translated four of the principal works attributed to Nägarjuna, viz., the Madhyamaka-sãstra (i.e., the Madhya-mika-kãrikã, with the commentary of Pingala), the Dvadasmukha sastra, the Dasabhümi-vibhãsã-sãstra and the Mahã-prajnapãramitã—sãstra. He translated also Deva’s Sata—s’ãstra. We are told that he commenced the translation of the Sãstra in 402 and finished it in 405; 6 but it is possible that he began his work while he was still in Ku-tsang. Although it seems that Kumrajiva did not himself write much, still under his influence this branch of Buddhist philosophy came to be mu studied and some brilliant minds in China have left records of their deep study of this school. Seng-chao and Chi-tsang are preeminent among these. Chi—tsang, an important Chinese master the Mädhyamika philosophy, has left records of extensive use of the Sãstra. (T. 1851) (Exposition of the Meaning of Mahayãn) of Hui-yüan (523—92) also makes extensive use of this text. Hui-yü has arranged his exposition of the topics so as to contrast the accounts of Abhidharma (Sarvästivãda) and Satyasiddhi with the account Mahãyãna and under the latter he cites throughout the relevant passage from the Sãstra. These works of Chi-tsang and Hui-yuan were of great help to me in coordinating and organizing my materials. We have also an analysis and notes on the Sãstra prepared by one Hui-ying. So far our understanding of Nagarjuna’s philosophy has been large based on the Kãrikã, which is all too abstract and overwhelmingly negative in emphasis and character. But the Kãrikã contains not only negative arguments but also utterances of truth that speak of the Mädhymika’s outlook on life. Still, on the basis of the Kãrikã alone it is difficult to get a clear picture of the Mãdhyamika philosophy. In this the Sastra is more helpful. It provides us with a complete picture of the Mdhymika philosophy. In the light of the Sãstra the negative arguments of the Karikã gain the much needed concrete setting by which one can fix in its proper place in this total picture. Accordingly the Karikã which the most basic and the best known work of Nãgärjuna has been kept view throughout the present study. The parallel passages from it have been noted and at times the negative arguments of the Sãstra have been amplified by it. The Introduction contains a short account of the life and work Nãgärjuna. I have tried to give there a detailed account of his works available in original Sanskrit and of those that are attributed to him the Chinese and the Tibetan traditions, including their restorations and retranslations by modern scholars. While the primary source of the present study is the .Sãstra itself, other works that can be reasonably attributed to Nagãrjuna have also been referred to wherever they are relevant. As the present work is primarily a philosophical study, the historical sequence of Buddhist philosophy in its various aspects has hardly been touched. However, the Introduction contains a short historical account of its broad lines as an aid to lead up to the present topic. No reference is made to the general background of Indian philosophy, nor even to any non—Buddhist schools, with the exception of Sankhya, Vaiesika md Nyaya. References to these were necessary in order to discuss certain problems where the Sãstra itself has referred to their views. An exception is made in the case of Jainism and a short account is given of the Jaina non—absolutism of judgments contrasting it with the relativity of Madhyamika. The Conclusion ‘summarizes (ch. XII) briefly the development of the philosophy of the Middle Way in India and in China the early part of its career. But this account is admittedly an over— simplification intended only to assist further studies that may be conducted in this field. The Conclusion contains also a very brief account of Advaitavedãnta of Sañkara so as to show some lines of similarity difference between it and the philosophy of the Middle Way, but this is done only in a cursory way. In all these matters a certain self-imposed limitation was considered essential, although naturally it is hoped that the present work may lead to further historical, critical and comparative studies, by providing these with the necessary first acquaintance with the subject matter of which this is an exposition. The present attempt is to provide the materials contained in the as far as possible through direct citations from it replenished with-interpretative statements. It was thought advisable to adopt this method reason that the entire text of the .Sästra has so far been a closed the English reading public. It is for the first time that an attempt o study the text extensively with a view to arriving at the comprehensive picture that it provides of the philosophy of the Middle Way, through direct citations from it in English translation. I have collect all the passages of the Sãstra which are relevant to the study of the philosophy of the Middle Way. Of these passages I have treated in greater detail those which concern the problem of knowledge and the problem of reality. Thus chapters lI—VI deal with problems concerning concepts, knowledge, ignorance and with certain quest regarding the critical examination of categories. Chapters VIl—IX with the actual critical examination, bearing out its import, with roots of the life of conflict and suffering, and with the right understanding which leads to the realization of the highest truth namely, the divided being (advaya_dharma), the ultimate end of man’s thirst for the real (dharmaisanã ). Chapters X—XI of the present work deal very briefly with the cultivation of the Way which leads to consummation, viz., the complete extinction of ignorance and passion and their transformation into wisdom and compassion. It is to be remembered that the wayfaring is deepening of one’s assimilation of the truth that one finds in the en examination of things by means of reason or rational investigation, in the light of the sense of the real. The factors of the Way are the various stages and elements in this course of deepening and widening one’s comprehension through the two phases: right understanding and meritorious action that springs from compassion prajna and punya. It is to an exposition of this deeper implication of wayfaring that the chapters, X—Xi, are devoted. Throughout it is the skillfulness of non-clinging which springs from the proper understanding of things that is the pervading spirit of the philosophy of the Middle Way. As the Sãstra abounds in repetition it was found necessary to g together the relevant passages in the case of every topic, but to give usually only one of them in the text, and furnish references to others in the notes. In some cases where different passages seem to touch different aspects of the same problem, it was found advisable to present these passages in the text itself, eliminating repetitions as far as possible. Again, in addition to directly citing from the text in closely printed passages, at times paraphrasing has also been adopted; and in this latter case, the translation is at times somewhat free. Passages paraphrased have not been closely printed but at the end of a paraphrased passage notation is given and the reference is given to its occurrence in the Chinese text. Parallel as well as other relevant passages, wherever they occur, have likewise been adduced. Attempt is made to give the Chinese characters in the case of technical or key terms where they were considered to be helpful. Sanskrit terms have been introduced. As far as possible attempt is made to give their equivalents in English at their first appearance. It is most difficult to convey the precise sense of the technical terms of one language in the technical terms of another; and within the same language, the senses that terms convey differ from system to system. It is necessary to paraphrase terms, to collect and corn— are their different uses within the same system, and in the same text in different contexts. Some terms indeed must just be kept untranslated. All these methods have been adopted in the course of this work. Some terms have been discussed, and their meanings distinguished within the body of the text. Such are, for example, terms like nãma, laksana, parjana, tathatã, svabhãva, dharrna—dhãtu, bhãta—koti. Of all these terms the Sastra itself gives their different imports in different contexts and these nave been mentioned in the body of the present work. Again, terms like grãha, samjñã, smrti, viparyaya or viparyãsa, ksãnti, had to be mentioned specially and their different imports delineated in the notes. Svebhãva, literally self—being, has been rendered as “absoluteness” or “unconditionedness,” specially in referring to sasvabhavavãda, which has been rendered here as “the error of misplaced absoluteness.” Advaya and anutpada have been rendered as “undivided” and “unborn.” In the case of such negative expressions it is not the not—yet—divided or the not-yet-born that is meant. The meaning is the dharma devoid of all divisions, the ultimate truth of birthlessness, unaffected by time. Similarly the term “indeterminate” as used here does not mean indistinct or vague; it stands for the ultimate reality beyond determinations. To prepare myself for the understanding of the Prajñãparamitã-’sãstra I first read through and compared the Chinese translations of the Madhyamikã and the Pancavimsati-sahasrika-prajnãparamitã with the Sanskrit originals. This has enabled me to furnish Sanskrit equivalents in many cases for the Chinese technical terms in the Sãstra. In some cases a single Chinese word is used in many meanings, often representing more than one Sanskrit term. I have given special care to collecting and comparing occurrences of such terms, e.g. My study and translation of the Sãstra were based on the woodcut edition of (T883 ‘1884 A.D.). But in the fin, revision of the work, the references have been made to the Taish edition of the Chinese Tripiaka. The beginnings of my study of the Mãdhyamika philosophy date back to my undergraduate days in the Mysore University in the years 1942—1943, and are due in particular to the incentive of Professor Radha krishnan’s presentation of the philosophy of Nagarjuna in his Indian Philosophy, vol. I,(George Allen and Unwin, 1923), pp. 643—669. Continued my studies at the Benares Hindu University under his guidance. I wish to acknowledge here my deepest sense of gratefulness to this great teacher for the immense help and encouragement I have obtained from him. I found Professor Stcherbatsky’s Conception of Buddhist Nirvanã, which embodies a translation of Chapters 1 and XXV of the Kãrikã with Candrakirti’s Prasannapadd, of considerable help in n early stages. My study of the Chinese Buddhist texts began in Chin; when I was a Government of India Research Scholar at the Nation University of Peking in the years 1947—1949, under the guidance of professors T’ang Yung-t’ung and Wang San-ti’en professor Wang San-t’ien was particularly helpful to me in my study of the different commentaries on the Mãdhyarnika—karikã, preserved in the Chinese Collection. My work on the Prajnãpäramita-s’astra started in Visvabharti University, early in 1950, under the encouragement and guidance of its late Vice-chancellor, Dr. P.C. Bagchi. The major portion of my work was done under him and I regret that this work could not be completed during his life—time. I was able to give further shape to this work when Professor S.N. Bose who succeeded Dr. Bagchi as the vice-chancellor of the Visvabharati University, very kindly took the initiative to get me relieved of my teaching work for several months urn I left for the United States for study as a Visiting Scholar at the Hardvard-Yenching Institute. I am deeply grateful to Professor S.N. Bose for his very kind help. Also my sincere thanks are due to the members of the department of philosophy of the Visvabharati University including its chairman Dr. Kalidas Bhattacharya, for the readiness goodwill with which they shared among themselves the teaching work that should have been allotted to me during those months. I express hereby my sincerest gratitude to the authorities of the harvard-Yenching Institute for the splendid opportunity they provided for me to work in this Institute. I found here able professors eager to render all the help I needed. Professor Yang Lien-sheng gave me unstinted help by going through my entire translation from the Sãstra and gave suggestions to improve its presentation. Professor Daniel H.H.Ingalls, Chairman of the Department of Sanskrit and Indian Studies, read the whole work, gave clarity to my thought and improved my expressions. At the request of the Harvard-Yenching Institute, Dr. A. K. Reischauer, the author of Studies in Japanese Buddhism, read the MS twice trimmed its language and suggested changes in the organization Introduction. This work was originally submitted and approved for the degree of or of Letters of the Visvabharati University. I am most thankful to Prof. W. Liebenthal who was till recently the Visiting Professor at the Visvabaharati University, to Prof. W.T. Chan of Dartmouth College, New Hampshire and to Prof. T. R. V. Murti of the Benares Hindu University for their valuable suggestions for improvement. I owe to Prof. Murti’s book, The Central Philosophy of Buddhism, (George Allen and Unwin, 1995), the impetus to rethink the central problem of tge philosophy of the Madhyamika school of Budhist thought. I am also indebted to him for his valuable bibliographical account (ibid. pp. 87-103). I wish to convey my indebtedness to Prof. D. M. Datta (retd. Prof. of Philosophy, Patna University) with whom I had the privilege to have many conversations; the chapter Extremes and Alternatives is chiefly the outcome of these. Of others who read the MS and suggested improvements mention must be made of Prof. E.A. Burtt if Cornell, Prof. J.R. Ware of the Harvard- Yenching Institute, Prof. Nagao Gadjin of Kyoto University and Father Casey (Maryknoll Fathers, Boston). I am thankful to Prof. Tsukamoto Zenryu of the Research Institute for Humanistin Studies of Kyoto University for drawing my attention to the bibliographical account of Hui-ying. In regard to my approach to the Pali Nikãyas I have derived much help from Ananda K. Coomaraswamy and I.B. Homer: Living Thoughts of Gautama the Buddha (Living Thoughts Library, Cassell & Company Ltd., London, 1948). I cannot adequately state how deeply grateful I am to the authorities of the Harvard—Yenching Institute, especially to its Director, Dr. Edwin O. Reischauer, for his interest in my work from the beginning of stay at Harvard and for extending to me every kind of help culminating in the acceptance of this work for publication. Thanks are also due to the library authorities of the Visvabharti University and to those of the Harvard—Yenching Institute and Widener’s Library. I wish to acknowledge with a deep sense of gratitude the unfailing encouragement and cooperation I have constantly received from wife.